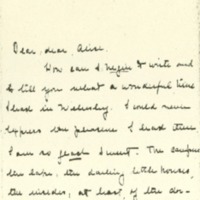 Jessie writes to her friend Alice to describe her recent travels and to ask Alice to send her Bible that she had left behind during her visit. Care of Mrs. T.D. Peck. How can I begin to write and to tell you what a wonderful time I had in Wellesley. I could never express the pleasure I had there, I am so glad I went. The campus the lake, the darling little houses, the insides, at least, of the dormitories, and most of all the opportunity to know you and Anna better have made these four days really wonderful. Our seeing of each other must not stop here, we must go on and know each other always better still, and see something more of each other. Letters will be all very well but not enough and I hope you can come to Princeton sometime. I had a very nice journey up here. A Smith girl from Springfield sat opposite me, and we discussed all kinds of weighty subjects college versus home education (please excuse my pen, it belongs here) bad versus badly in the phrase I feel badly, proper street dress, she was quite shocked at the way people dressed in New York, their s, you know, quite shocking! During the conversation I remarked on the beauty of the leafless trees. She violently disagreed I suppose now because they were shockingly undressed. She was interesting. I like to rub up against people of different points of view. We disagreed in almost every thing. Then from Westfield on a Southern woman from Texas sat opposite. It turned out her son was Princeton1908, and at once we developed mutual intersts and subjects for conversation. So you see I didn't sleep: but the time went quickly and I was glad to talk because otherwise I would have had more time for dreading this visit. Mrs. Peck, however, was so cordial and sweet, called me 'Jessie' at once, so fed me and regaled me, with almost a dinner, that I felt at home at once. She is a charming woman and her daughter, aged twenty-three is very like her, so I foresee a pleasant two days. Whew, it is cold here. The leaves are falling the wind is blowing, and I am sitting with my coat on writing to you with icy hands. Quite a change from sunny golden Wellesley. We are a thousand feet higher than you. Oh by the way, Alice, what do you suppose I left at your house, not the little pin, which I found, but—let me look once again to be quite sure,—yes I left my Bible, my little testament. Isn't that disgraceful. How could I have done it. And now the trouble is whether to ask you to send it. I suppose since my stay here is so uncertain—I want to leave Thursday—that you had better send it home Isn't that frightful to be Bibleless for three days. I suppose I must take my courage in both hands and ask Mrs. Peck for one. Dear, dear, why was I so careless. My Bible of all things. Well, I must get ready to go out—and freeze. Give my love to all the Mountain Lake girls and especially to Anna, and remember me to your other splendid friends, Misses Cecil, Hillbourne, Hoyt, Hanford, Jacobs, etc.Oct. 20, 1908. Sayre, Jessie Woodrow Wilson, 1887-1933, “Jessie Woodrow Wilson Sayre to Alice Appenzeller,” 1908 October 20, WWP17447, Jessie Wilson Sayre Correspondence, Woodrow Wilson Presidential Library & Museum, Staunton, Virginia.